The TrustSpot logo now has 2 contrast options for both light and dark background colors. Inline stars can now be enabled to show as empty stars when no product reviews exist (instead of hiding the widget all together). Inline stars now have an option to show/hide the review count. Support for Multi-SKU input, which will allow stores to have a single review display for grouped products. Similar to our Bulk Invite for Company Reviews, just upload a CSV file with the Customers Name, Email and Product SKU and we will send a review request out to them shortly. 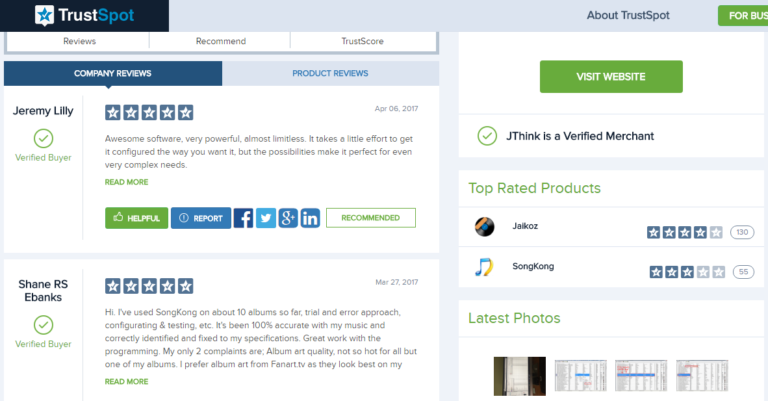 We updated our public facing profile page to now show Product Reviews, in addition to the standard Company Reviews. We also added support for showing your Top Rated Products and Photos that have been added for reviews. These improvements allow you to show off more reviews and more user generated content to potential customers. To see an example of this, visit our merchant JThink’s profile page. As we continue to grow within Europe, we are always looking to add new languages to support our growing international customer base. For this release, we added support for Norwegian.